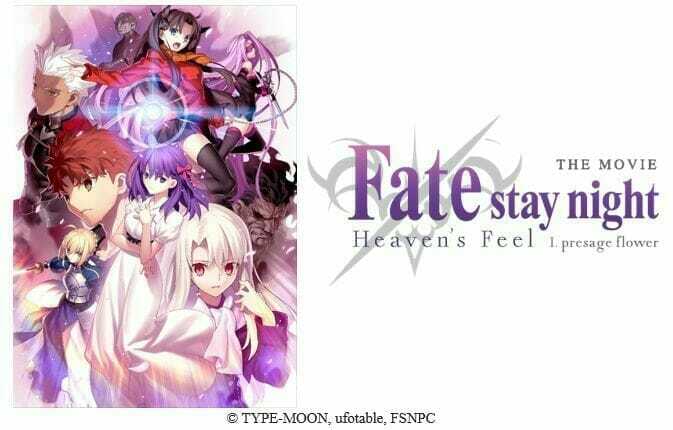 Aniplex of America announced that they will host a premiere event for Fate/stay night [Heaven’s Feel] THE MOVIE I. presage flower. Tickets for the event, which will be held on November 3, are available via AXS. The premiere will be held at Los Angeles’ “The Theatre at Ace Hotel”, on South Broadway. Doors will open at 5:00PM Pacific. SANTA MONICA, CA (October 1, 2017) – Aniplex of America Inc. announced today at their industry panel at Anime Weekend Atlanta (Atlanta, GA) that the highly-anticipated film Fate/stay night [Heaven’s Feel] THE MOVIE I. presage flower will make its U.S. premiere at The Theater At Ace Hotel in Los Angeles, California on November 3rd. This movie will be the first feature film from the Fate series to receive a U.S. theatrical release and kick starts the new film trilogy based on the visual novel Fate/stay night. Tickets to the Los Angeles premiere event goes on sale today, with the promise of a nationwide theatrical release details to be announced at a later date. Fate/stay night [Heaven’s Feel] THE MOVIE I. presage flower is the latest installment of the beloved Fate series by TYPE-MOON, and will be featured as an epic film trilogy that will finally unveil all of the mystery and bloodshed behind the high-stakes Holy Grail War. Based on the wildly popular Fate franchise that gave anime fansFate/stay night [Unlimited Blade Works], Fate/Zero, and the hit mobile game Fate/Grand Order, the first film in this movie trilogy explodes with epic action and heart-wrenching drama, tied together by original author Kinoko Nasu’s unique storytelling and otherworldly cast of characters. Fate/stay night [Heaven’s Feel] THE MOVIE I. presage flower prominently features the tragic heroine of Fate/stay night, Sakura Matou, as she desperately tries to hold on to the happiness she had at the Emiya household prior to the Holy Grail War. Movie-goers will experience the despair, romance, and terrifying secrets of the Holy Grail War with protagonist Shirou Emiya in the first chapter of this high-stakes trilogy. The film summons the all-star cast from Fate/stay night [Unlimited Blade Works], including Ayako Kawasumi as Saber, Noriaki Sugiyama as Shirou Emiya, Junichi Suwabe as Archer, Hiroshi Kamiya as Shinji Matou, and Noriko Shitaya as heroine Sakura Matou. Composer Yuki Kajiura (Puella Magi Madoka Magica, Sword Art Online) will provide the soundtrack for the film, and director Tomonori Sudou (God Eater, the Garden of sinners/recalled out summer) returns to the Fate series to craft the events of the visual novel into the complete cinematic experience. Celebrated animation studio ufotable (Fate/Zero, Fate/stay night [Unlimited Blade Works], the Garden of sinners) returns to produce TYPE-MOON’s work, promising all of the dynamic action of the previous installations. 10 years after the Holy Grail War—a battle waged by Masters and Servants over the wish-granter, the Holy Grail—another war breaks out in Fuyuki City. Along with Saber, the Servant he summons, Shirou allies himself with the mage Rin Tohsaka and takes part in the Holy Grail War. Aniplex of America Inc. (Santa Monica, California) is a subsidiary of Aniplex Inc. (headquartered in Tokyo, Japan), a group of Sony Music Entertainment (Japan) Inc. and a leading provider of anime content and music production and distribution in Japan. Aniplex of America has launched fan-favorite Blu-ray and DVD releases includingFate/stay night [Unlimited Blade Works], Fate/Zero, the Sword Art Online series, Your lie in April, KILL la KILL,Bakemonogatari, Puella Magi Madoka Magica, Blue Exorcist, NISEKOI, the OREIMO series, DURARARA! !×2,Magi series, Expelled From Paradise, The irregular at magic high school, and ALDNOAH.ZERO. The company’s ever-growing line-up of shows include: March comes in like a lion, Blue Exorcist: Kyoto Saga, ERASED, The Asterisk War, OWARIMONOGATARI, KIZUMONOGATARI, Charlotte, Occultic;Nine, WWW.WAGNARIA! !, GRANBLUE FANTASY, Eromanga Sensei, and Katsugeki TOUKEN RANBU. In June 2017, the company launched the English version of mobile game, Fate/Grand Order, which quickly exceeded one million downloads. Based on the popular Fate series, Fate/Grand Order is currently available on iOS and Android.